Home » Wines, beers & spirits » Montalcino Wines, ‘Life in Italy’! Montalcino Wines, ‘Life in Italy’! The wine growing and producing company which is run at Montalcino (Siena) by Luca Brunelli alongside with his parents Mauro and Anna is young, but already distinguishes itself for both results and future targets. Quality of its products, seriousness, and much work are the ‘motive wheels’ of a ‘machine’ which, thanks to some hectares of vineyard facing hillside at a height between 200 and 300 metres, since 1996 has produced and exported all over the world two of the most known and appreciated wines, both DOC (guarantee of origin) and DOCG (controlled and guaranteed denomination of origin) certified: Brunello di Montalcino and Rosso di Montalcino. Luca, the owner, explains: «Brunello is ‘of Montalcino’ origin because only here the perfect balance and ideal ripeness of Sangiovese come true. Then, trained and expert hands give voice to the fruit of our vineyards, by means of production and refinement. Both our consumers and the whole world of wine should thank those hands. Brunello is considered as an excellence of made in Italy because it goes beyond ‘Made’ and arrives to ‘Life in Italy’: it conveys tradition, quality, land, and human values; it is able to improve every year. Since the end of the nineteenth century it has been able to win both tables and most ambitious places of international catering, so marking the history of wine growing and producing production and teaching to the world the meaning of ‘agriculture’». Brunello di Montalcino, a red wine characterized by a long ageing as well as extraordinary elegance and concentration, shows wide and celestial scents, with notes of soft fruits, sour cherry, and vanilla. It has an elegant character and an intense ruby colour, its taste is full, savoury, harmonious, tannic, and its perfume reaches mineral touches of tobacco, liquorice, and juniper. According to the oenologist Paolo Vagaggini, this aroma unites the whole production of Brunelli’s company. About 60,000 bottles per year are produced, 95% of which are exported in Europe and USA, the two reference markets, besides Mexico, Peru, Singapore, and Japan, thanks to importers who resell it to specialized distributors and restaurants. Rosso di Montalcino, which has always been considered as the ‘younger brother’ of Brunello, is indeed a wine characterized by high class and prominence, robust, and with a strong character, but at the same time pleasant. It distinguishes itself for its ruby colour, scent, whose fruity notes in sour cherry and soft fruits join light scents of vanilla and spices, as well as its softness, freshness, and heat it releases, which fills the mouth and persists for a long time. Thanks to its balanced and full flavour, it is suitable for every occasion and expresses itself at its best with first courses seasoned with meat sauces, mixed grills, roasts, and mid-ripening cheeses. Brunelli specifies: «My ‘Rosso’ is an important international wine, a main character that is born in order to develop all the characteristics of the land of Montalcino and Sangiovese at their best, proposing a fresh and young tone, but, at the same time, ambitious and powerful. 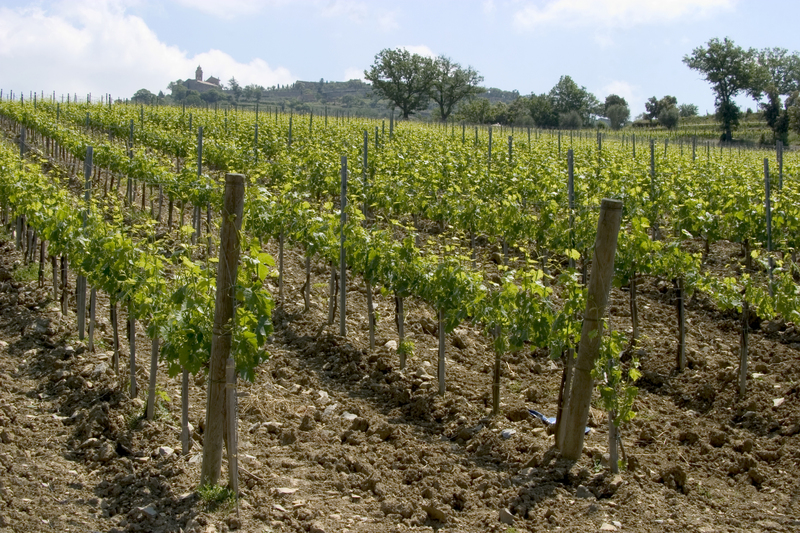 Sangiovese vineyard is perfect for wines characterized by a long refinement, but is also able to develop when young». So, as it happens for Brunello, Rosso di Montalcino, too, that has been in the list of big wines for many years, talks about work, experience, land and wise innovation of Tuscany. For it, too, the company uses the same distribution channels as for Brunello and, while it aims at enter Asian market, exports the 25,000 bottles it produces every year for 40% in Northern Europe, 30% in the USA, and 25% in the rest of the world. A very important element for Brunelli is packaging, which is rigorously realized in an artisan way. The company invested much on it. 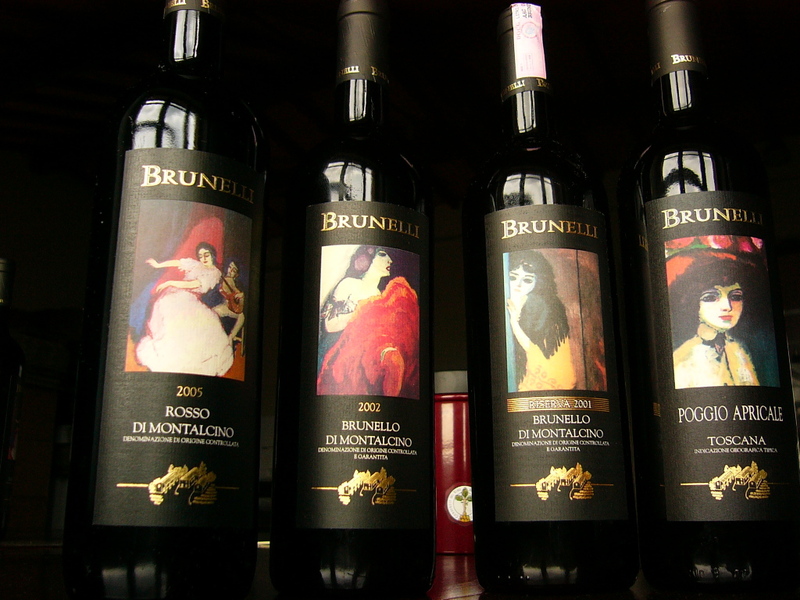 3-4 different types of packagings are used and on each one the trademark ‘Brunelli’ is conveyed. In addition, the products show themselves in an elegant way, thanks to the contrast between the black of the bottles and bright colours of the labels, expressly realized for each wine. Brunelli closes: «On our labels, I tried to associate and connect the ones that for me are the three joys of life: art, beauty, represented by women, and good wine. For the future, we will certainly try to consolidate what we have been able to create during these years, pursuing the aim of quality and production, and we will aim at growing on the markets, in case by means of profitable, agile, and dynamic collaborations among companies, for instance making good use of enterprise networks or temporary business associations».